Winter will be creeping in soon, and that means time to book some time in the sun. But a lot of people I know are a little leery of heading off into strange, unknown destinations, especially those Brits who don’t get out much – and I hear you, why go all that way when you could just chill out at home. St. Kilda, Melbourne. My favourite beach on this list. But some sun is just what the doctor ordered, and if you visit one of the British “Commonwealth of Nation” countries, you’ll find plenty of home creature comforts, all in a shorts-and-sandals temperature. If you aren’t familiar with it, the commonwealth is more of a political organisation than anything, but many of the countries are former colonies, hence the historical and cultural link. As it happens, many of these countries also have good air links with the UK, which makes getting there faster and cheaper. Officially “Antigua and Barbuda”, this Caribbean island is well known for it’s luxurious options for an escape. Deals can still be had, especially if you look around for off-the-beaten-path options (which, as an island, doesn’t mean going far). And beaches? Oh yeah – Dickenson Bay or Turner Beach are perennial favourites. Australia is a great destination in our winter, as it’s summer down under! So many great places to go, but if you’d like my own recommendation, my vote will always go to the beach at St. Kilda in Melbourne. Sydney does, of course, have the famous Bondi Beach as well – be sure to do the shore walk if you end up here. With 29 islands and 661 cays (super tiny, mini islands), sand is in good supply in the Bahamas. It’s very very popular, which means crowds – but also lower prices. Check out Stocking Island, Cable Beach (very famous), or Xanadu Beach. I’ve not been to Barbados, but it is one of my hottest destinations because of a good friend who now lives there. Barbados has the party scene, but it’s also got some good options for romantic, more secluded beaches, as well as maybe not secluded but more “chillout” zones. And as far as costs, I think travel options here are a bit more reasonable than other Caribbean spots. For the foodies who want beach + calories, then my vote goes to Belize, where every meal – from brekkie to the final dessert of the day – is tasty. Belize doesn’t have as much wide-open beaches as elsewhere, as the shores are often shaded by mangrove forests, but along the Placencia Peninsula you’ll find plenty of sun soaking opportunities. Ok, so I wouldn’t put India at the top of my list for “relaxing” holidays, but if you want to have both some cultural experiences as well as down time at the beach, India is a good bet. 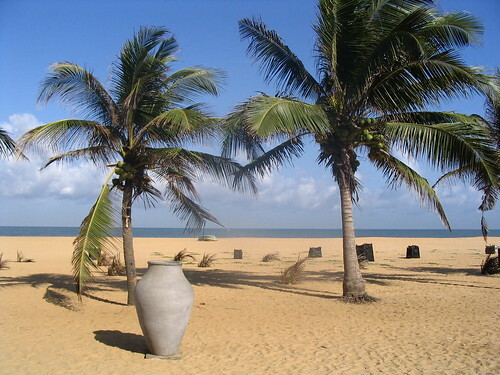 Goa is one of the more popular stops, but there are many others – Kerala, Pondicherry, Gujarat. I’d barely heard about Seychelles, until I met someone in Edinburgh who used to work at a hotel here. The photographs, the stories, the food, the recommendations were non-stop. With 115 islands to choose from, I’m sure you’ll find just the thing. Out in the great Pacific Ocean, Papua New Guinea is a fantastic destination if you want to split your beach time with some scuba diving or snorkelling around ship wrecks, coral reefs, all in perfectly clear seas. I perhaps selfishly include Sri Lanka on the list because they are home to my favourite tea, Ceylon. Visiting a tea plantation – or better yet, staying on one – should be at the top of your list, but then head for the south and southwest for beach time, perhaps in Bentota or Aluthgama. Last but not least, South Africa certainly makes out well on the beach side of things – being the tip of a continent, they’ve got miles of shore, and many of their beaches are year-round destinations, such as the famous Cape Vidal in KwaZulu-Natal, or Camps Bay on the Western Cape.